World’s first prosthetic (artificial) leg capable of simulating the feelings of a real limb and fighting phantom pain was unveiled by researchers in Vienna, Austria. The first of its kind medical innovation is the result of a two-fold process which is developed by Professor Hubert Egger at the University of Linz, Austria. 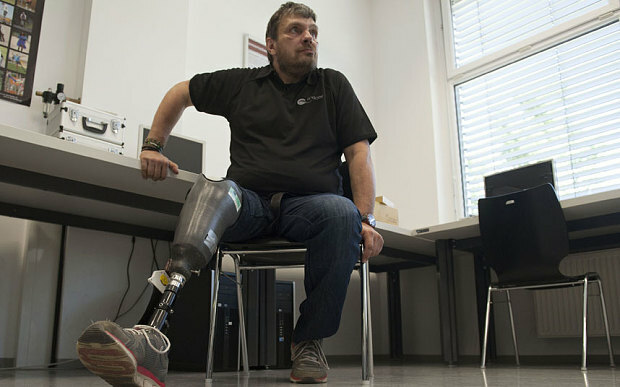 This prosthetic leg was fitted on Wolfgang Rangger who had lost his right leg in 2007. The new feeling prosthetic leg was rewired to remaining foot nerve endings from Rangger’s stump to healthy tissue in the thigh by surgeons. Six sensors are fitted to the foot sole of prosthesis which are relayed to a micro-controller and linked to stimulators inside the shaft where the stump sits. These small sensor devices measure the pressure of heel, toe and foot movement and send these signals to the brain every time Rangger takes a step or applies pressure. The sensors also tell the brain there is a foot and the wearer has the impression that it rolls off the ground when he walks. The prosthesis also provides another remarkable function i.e. eradicate the excruciating phantom pain Mr Rangger had experienced for years following his amputation. This pain occurs because the brain gets increasingly sensitive as it seeks information about the missing limb. Earlier in 2010, Austrian scientist he presented a mind-controlled prosthetic arm or bionic hand which allowed the amputee to feel sensations from their fingers. Cyclonic storm Ashobaa in Arabian Sea is the first tropical storm of the pre-monsoon season in the Indian seas. 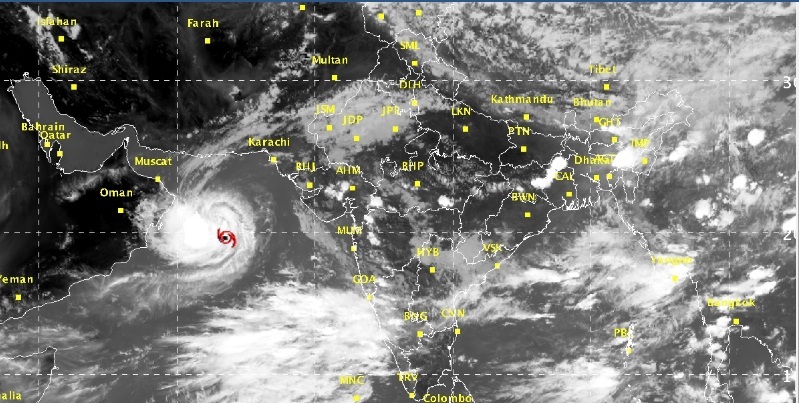 The cyclonic storm was formed after intensified deep depression (low pressure zone) was developed over east central Arabian Sea about 590 km west southwest of Mumbai, 470 km southwest of Veraval (Gujarat) and 960 km east-southeast of Masirah Island (Oman). After its formation the cyclonic storm has moved northwestwards. The system has potential to intensify further. But this cyclonic storm will not hit Indian states severely as it has further moved north-northwesterly direction towards Oman. Northwestern coastal states of India such as Maharashtra, Goa, Gujarat and Karnatakawill only face strong winds along with showers. The name Ashobaa to this tropical storm was given by Sri Lanka which is one of eight countries that are naming tropical cyclones in North Indian Ocean region on rotational basis. The series of naming by countries is Bangladesh, India, Maldives, Myanmar, Oman, Pakistan, Sri Lanka and Thailand. The last cyclone called Nilofer (2014) was suggested by Pakistan. Next cyclone formed in future will have name Komen, suggested by Thailand. Advantages of naming cyclones/ storms: Provide easy communication between forecasters and the general public regarding forecasts and warnings. Since the storms occur in the same basin at the same time, names can reduce the confusion about what storm is being described. President Pranab Mukherjee has appointed Vijai Sharma as Chief Information Commissioner. He will have tenure of for 5 years or till they attain the age of 65, whichever is earlier. Vijai Sharma is a 1974 batch IAS officer of Uttar Pradesh Cadre. 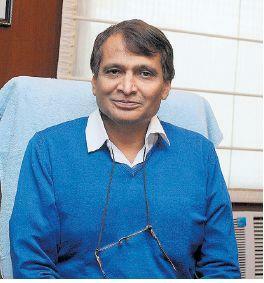 Prior to this appointment he was serving as information commissioner in Central Information Commission since 2012. He has rich work experience in Administration & Governance and Law & Policy in Central and State Governments and United Nations. He also had served as Environment secretary. Vijai Sharma’s name for Chief Information Commissioner was finalized on June 1, 2015 by selection committee headed by Prime Minister Narendra Modi and comprising Union minister Arun Jaitley as well as Leader of Congress in Lok Sabha Mallikarjuna Kharge. The Right To Information (RTI) Act, 2005 provides for establishment of Central and State information commissioner as a designated statutory authority to receive and inquire into a complaint from any person. The general superintendence, direction and management of the affairs of the Commission are vested in the Chief Information Commissioner, who is assisted by the Information Commissioners. Under the CIC, the Chief Information Commissioner enjoys complete financial and administrative powers of a Department of the Government of India except in matters relating to the creation of posts, re-appropriation and writing-off losses for which it needs the specific concurrence of the Ministry of Finance. The Chief Information Commissioner and Information Commissioners are appointed by the President on the recommendation of a selection committee comprising of Prime Minister as Chairperson, the leader of single largest opposition party in the Lok Sabha and a Union Cabinet Minister to be nominated by the Prime Minister. Tenure: Chief Information Commissioner and Information Commissioner hold office for a term of 5 years or till he attains the age of 65 years. The Chief Information Commissioner is not eligible for reappointment. Wajahat Habibullah was India’s first Chief Information Commissioner. He was appointed on 26 October 2005. 16th edition of the International Indian Film Academy (IIFA) informally known as the “Bollywood Oscars,” was held in Malaysia. The award ceremony was held in Putra Indoor Stadium Kuala Lumpur, Malaysia. 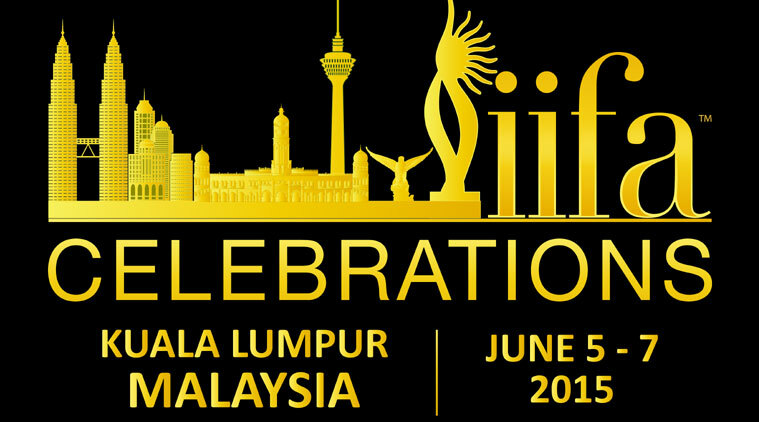 The 2015 IIFA Awards honoured the best films of 2014 and the ceremony took place from June 05 to 07, 2015. Haider was awarded the most awards (09). Special Awards IIFA Award for Outstanding Achievement in International Cinema: Subhash Ghai. Best Makeup: Preetisheel Singh & Clover Wootton – Haider. Best Production Design: Subrata Chakraborty & Amit Ray – Haider. Best Sound Mixing: Debajit Changmai – Haider. Best Sound Recording: Eric Pillai for Galliyan – Ek Villain. 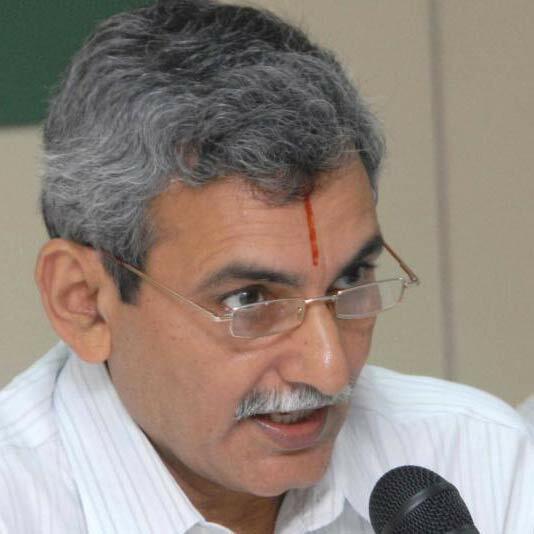 President Pranab Mukherjee has appointed KV Chowdary new Central Vigilance Commissioner. He was appointed by President on the recommendation of Select committee headed by Prime Minister Narendra Modi and comprising of Union Home Minister Rajnath Singh as well as Leader of Congress in Lok Sabha Mallikarjuna Kharge. He is 1978-batch IRS officer of the Income Tax cadre. 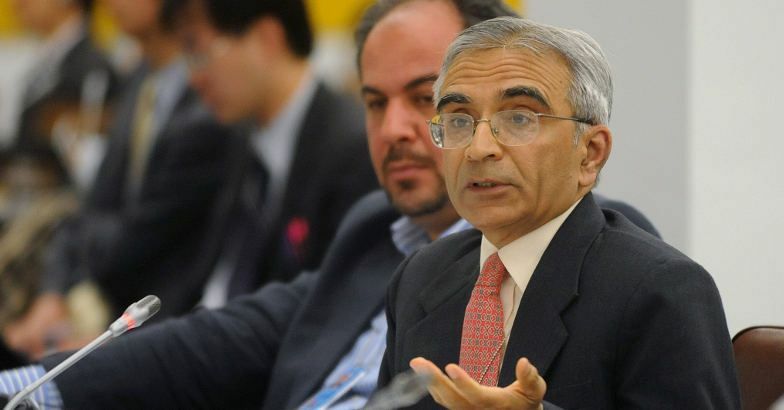 He also had served as Chairman of the Central Board of Direct Taxes (CBDT), an apex authority of the Indian Income Tax department. Prior to this appointment Mr. Chowdary was working as the adviser to the Supreme Court-appointed Special Investigation Team which is probing black money cases. CVC was set up by the Union Government in February 1964 on the recommendations of the K. Santhanam Committee on Prevention of Corruption. The CVC is an apex body of Union Government formed to address governmental corruption. It has the status of statutory autonomous body and free of control from any executive authority as per the provisions of Central Vigilance Commission (CVC) Act, 2003. The CVC is headed by a Central Vigilance Commissioner and has two Vigilance Commissioners. Appointment: Central Vigilance Commissioner and has two Vigilance Commissioners are appointed by President on the recommendations of select committee comprising of Prime Minister as Chairperson, Union Minister of Home Affairs and Leader of the second largest party in the Lok Sabha or majority group leader in parliament. Functions: To monitor all vigilance activity under the Union Government and advise various authorities in Union Government organizations in planning, executing, reviewing and reforming their vigilance work. Nittoor Srinivasa Rau was the first Chief Vigilance Commissioner of India. Indian Railways has inked Indian Institute of Technology (BHU) Varanasi for research and development work. This MOU is part of Malaviya Chair for Railway Technology, Varanasi. The MoU was been signed by Railway Board Advisior R K Verma and IIT (BHU)- Director, Professor Rajeev Sangal in the presence of Union Railway Minister Suresh Prabhu. The pact envisages for upgradation of Railway tracks for High speed trains and developing indigenous raw material for the industry in lines with Make India Programme. Apart from singing MoU it was also announced to set up Malaviya Chair Committee to supervise research work. The chair is being named after freedom fighter and Bharat Ratna recipient Madan Mohan Malaviya who was the founder of Banaras Hindu University (BHU). Union Railway Minister Suresh Prabhu also dedicated 1500th rail engine “Gaurav” for public services from Diesel locomotive works (DLW) at Maduadeeh, Varanasi. The Mangrove Forest Division (MFD) of Bhitarkanika in first week of June 2015 revealed that Bhitarkanika Wildlife Sanctuary of Odisha is witnessing an alarming denudation in large tracts of mangrove vegetation. The Bhitarkanika Wildlife Sanctuary is one of India’s biggest estuarine crocodile habitats and a major coastal eco-system. According to MFD, the denudation or saline blank formations have been noticed in Bhitarkanika forest block, which is measured at 1700 acre. It said that the denuded patches, spotted in Mathadia, could be over 30 acres in this block area. The denudation has been noted among the Avicennia and Excoecaria species, popularly known as Bani and Guan. As mangroves are just not a lifeline for the eco-system which is a home to a rich flora and fauna but it also acts as an environment cushion for the coastlines. The excessive salinity creates a blank formation over a period of time as the existing vegetation dies. 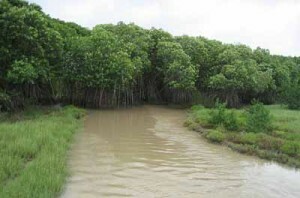 Most mangrove species have a salinity resistance that ranges from 5 ppt to 35 ppt. Only Avicennia marina species can tolerate up to 70 ppt salinity. Earlier, the Forest Survey of India-2013 report highlighted a drop in mangrove cover in the State by nine square km over 2011-from 222 sq km to 213 sq km. In Kendrapara district alone, where most of Bhitarkanika is located, the drop was by 4 sq km while in Bhadrak district, it was 2 sq km. In April 1975, ex-zamindari forests of Kanika Raj were constituted and declared as Bhitarkanika Wildlife Sanctuary by State Government of Odisha. Later in 1998, it was declared as a National Park because of its ecological, faunal, floral, geomorphological and zoological association and importance and for the purpose of protection. In August 2002, it was designated as the second Ramsar site (i.e. Wetland of International importance). This ecosystem harbours the largest number of saltwater crocodile population in the Indian sub-continent. Bhitarkanika’s famous Gahirmatha coast finds a prominent place in the turtle map of the world because of the distinction of having one of world’s largest nesting and breeding congregation of Olive Ridley Sea turtles. 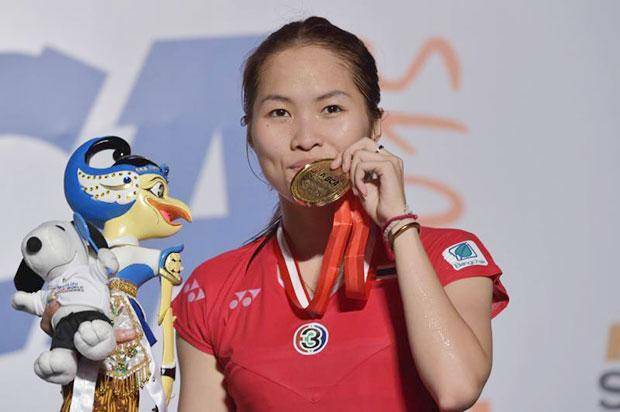 Japanese rising star shuttler Kento Momota and Thailand’s Ratchanok Intanon won the men’s and women’s singles respectively of the Indonesia Open Badminton tournament. Indonesia Open Badminton tournament was held at the Gelora Bung Karno Stadium, Jakarta, Indonesia. The total prize money at stake was 800000 US dollars. Kento Momota defeated Denmark’s defending champion and third seed Jan O. Jorgensen 16-21, 21-19, 21-7. Kento Momota is World No.9. This was the 20-year-old’s second victory in a Super series event. In the women’s singles final, former world champion and world No.6 Ratchanok defeated Japan’s world No.35 Yui Hashimoto 21-12, 21-10. Meanwhile South Korea’s Ko Sung Hyun and Shin Baek Choel beat China’s Fu Haifeng and Zhang Nan 21-16, 16-21, 21-19 in 53 minutes to win the men’s double title. In the women’s singles final, China’s Tang Jinhua and Tian Qing defeated Indonesia’s Nitya Krishinda Maheswari and Grysia Polii 21-11, 21-10. The mixed doubles title went to Xu Chen and Ma Jin, who beat Zhang Nan and Zhao Yunlei 21-17, 21-16. India’s campaign ended following Parupalli Kashyap’s loss to Momota in the semi-final. 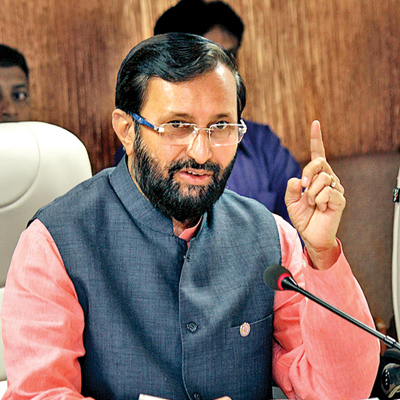 Union Minister of Environment, Forest and Climate Change (MoEFCC) Prakash Javadekar on 8 June 2015 cleared the Coastal Road Project of Mumbai, Maharashtra. This 12000-crore project will cover 35.6 km between Nariman Point and Kandivali, along the western seafront. The project will begin in mid-August 2015. The project will help in decongesting Mumbai roads and will also create 91 hectares of green space. The project was conceived by the previous Congress-NCP government after it decided to drop the extension of Bandra-Worli sea link project up to Haji Ali. Earlier on 6 June 2015, Maharashtra government signed a Memorandum of Understanding with the Government of the Netherlands for obtaining technical advice on feasibility of building Metro track along the proposed coastal road connecting north and south Mumbai. 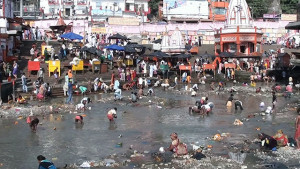 The National Mission for Clean Ganga (NMCG) and Nehru Yuva Kendra Sangathan (NYKS) on 8 June 2015 signed a 5-year Memorandum of Understanding (MoU) to establish a long-term partnership for the involvement of youth in the abatement of pollution and conservation of the river Ganga. The MoU aims to involve youth in creating awareness and outreaching public by carrying out afforestation drive for medicinal plants species, promoting sanitation and construction of toilets and educating people for tackling throwing of wastes into the river. 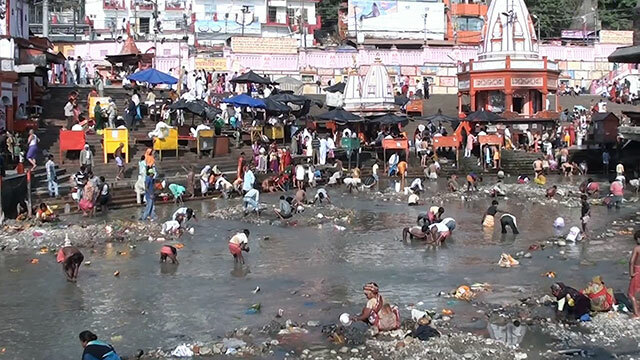 With the help of strong network of youths of NYKS, National Mission for Clean Ganga seeks to implement activities at local level that will encourage public participation and additionally, assist in restoring the health of Ganga river. The MoU also aims to promote Bio Agriculture and clean village under Clean Ganga Mission. Under the MoU, the youth will plant different kinds of saplings of medicinal plants, trees and fodder crops from Gangotri up till Ganga Sagar. NMCG is an autonomous society under Union Ministry of Water Resources, River Development & Ganga Rejuvenation that works for the implementation of the projects under National Ganga River Basin Authority (NGRBA). NMCG is the planning financing, monitoring and coordinating body at the Centre and being supported by suitable State level Programme management groups (SPMGs). NMCG is empowered to take all necessary actions that may be necessary or incidental for the achievement of the objectives. Nehru Yuva Kendra Sangathan (NYKS) is an autonomous organization under Union Ministry of Youth Affairs and Sports, formed to oversee working of the Nehru Yuva Kendras that provide rural youth avenues to take part in the process of nation building. NYKS channelizes the power of youth who are in the age group of 13-35 years on the principles of voluntarism, self-help and community participation. The core strength of NYKS is a network of 2.95 Lakh village level Youth Clubs across India with an enrolment of about 8.35 million volunteers in the age group of 13-35 years.